Hammersmith and Fulham’s elderly, sick and disabled residents turned up at the Town Hall on Monday night to demonstrate against H&F Conservative’s brand new charges for home care. The cabinet of Tory Councillors voted through the staggering £12.40 hourly fee for home care - reneging on a pre-election promise in the process. This service was previously provided at no charge to the user, the cost being already covered in the council tax payment. H&F Conservatives are introducing the new charges in the hope that this will contribute to their £36million cuts target which was agreed at the February budget meeting. Anyone wanting to demonstrate their support for the Hammersmith & Fulham Coalition Against Community Care Cuts (HAFCAC) can sign their petition by following the links in this story. Saffron Pineger, the Chronicle's chief reporter, has covered the story on the front page of this week’s edition (See scan). She interviews several residents who talk about their hardship. 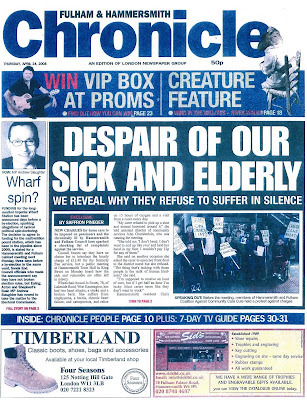 You can buy this week's Fulham & Hammersmith Chronicle from most good newsagents.